If you have a job today, there’s a good chance you personally reached out to your employer and interviewed with other humans to get it. Now that you’ve been there a while, it’s also likely the workday feels more like a long slog than the fulfilling career move you had envisioned. But if today’s early-stage startups have their way, your next employment experience could be quite different. First, forget the networking and interview gauntlet. Instead, let an AI-enabled screening program reach out about a job you don’t seem obviously qualified to do. Or, rather than talk to a company’s employees, wait for them to play some online games instead. If you play similarly, they may decide to hire you. Once you have the job, software will also make you more efficient and happier at your work. An AI-driven software platform will deliver regular “nudges,” offering customized suggestions to make you a more effective worker. If you’re feeling burned out, head online to text or video chat with a coach or therapist. Or perhaps you’ll just be happier in your job now that your employer is delivering regular tokens of appreciation. Those are a few of the ways early-stage startups are looking to change the status quo of job-seeking and employment. 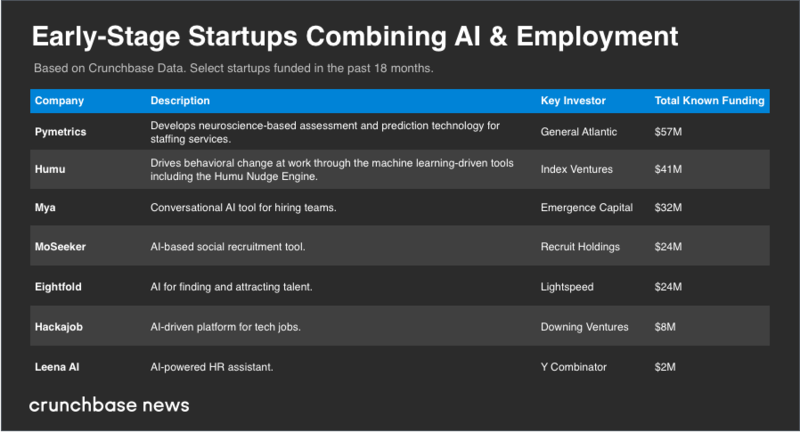 While employment is a broad category, an analysis of Crunchbase funding data for the space shows a high concentration of activity in two key areas: AI-driven hiring software and tools to improve employee engagement. Below, we look at where the money’s going and how today’s early-stage startups could play a role in transforming the work experience of tomorrow. To begin, let us reflect that we are at a strange inflection point for AI and employment. Our artificially intelligent overlords are not smart enough to actually do our jobs. Nonetheless, they have strong opinions about whether we’re qualified to do them ourselves. It is at this peculiar point that the alchemic mix of AI software, recruiting-based business models and venture capital are coming together to build startups. At present, even AI boosters don’t tout the technology as a cure-all for troubles plaguing the talent recruitment space. While it’s true humans are biased and flawed when it comes to evaluating job candidates, artificially intelligent software suffers from many of the same bugs. For instance, Amazon scrapped its AI recruiting tool developed in-house because it exhibited bias against women. That said, it’s still early innings. Over the next few years, startups will be actively tweaking their software to improve performance and reduce bias. Once the goal of recruiting the best people is achieved, the next step is ensuring they stay and thrive. Usually, a paycheck goes a long way to accomplishing the goal of staying. But in case that’s not enough, startups are busily devising a host of tools for employers to boost engagement and fight the scourge of burnout. The most heavily funded of the early-stage crop looks to be Peakon, which offers a software platform for measuring employee engagement and collecting feedback. The Danish firm has raised $33 million to date to fund its expansion. London-based BioBeats is another up-and-comer aimed at the “corporate wellness” market, with digital tools to help employees track stress levels and other health-related metrics. The company has raised $7 million to date to help keep those stress levels in check. Early-stage funding activity tends to be an indicator of areas with somewhat low adoption rates today that are poised to take off dramatically. For employment, that means we can likely expect to see AI-based recruitment and software-driven engagement tools become more widespread in the coming years. What does that mean for job seekers and paycheck toilers? Expect to spend more of your time interfacing with intelligent software. Apparently, it’ll make you more employable, and happier, too.